TWITTER is the best professional development tool that I have encountered in years. Twitter allows you to have conversations and get resources from like-minded individuals. It allows you to network with others in a way that transcends the walls of our schools and neighborhoods. It allows for 24/7 participation in 140 characters or less. That means quick sound bites that you can take and use. ALL of the new things that I have used in class for the last 2 years have come from a Tweet from my Twitter PLN. Every day I access my Tweetdeck and scroll through the nuggets of information available. I often find links to articles that interest me, resources that help me be a more efficient educator or activities that will engage and interest my students. What exactly is a TWEET?!?! 1. Profile picture: be sure to add a picture to will allow your followers to connect with you. It does not have to be a picture of you, this is a wordle that I use for an avatar. 2. Micro-blog message: Twitter allows you to post a message using 140 characters or less. 3. Reply button: click button to reply to the sender. 4. Delete button: click the trashcan if you have an uh-oh/whoops moment. 5. Favorite button: thick this button to ‘favorite’ a tweet. It also displays the number of times the tweet has been favorited. 6. Time stamp: time and date the tweet was posted. 7. Reply box: if replying to the tweet, put your message in this box. 8, Real name: your “real name.” I use Valerie Burton for my PLN and Ms. Burton for my students. 9. Twitter psuedonym: Twitter name, think carefully about how you want to represent yourself. You can change it, but try not to do this often because you don’t want to confuse followers. 10. Twitter mentions: your username preceded by the @ symbol in a Tweet is called it a “mention” and it means that someone is talking about/or to you. 11. Link: resource link included in the Tweet. 13. Picture: pictures can be uploaded into tweets. 14. More button: the more button allows you to send tweet as an email or get the embed code so that you can embed it onto your blog or webpage. #edchat: Tweeters will use the #edchat hashtag to indicate an important issue that they want to call to the attention of educators. 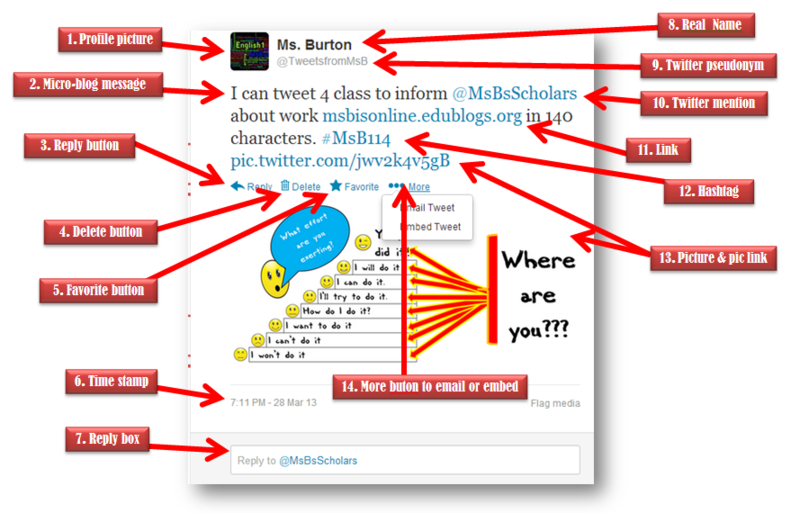 It is also used to promote weekly Twitter #edchat conversation. #ntchat: for new teachers. Their weekly conversations are Wednesdays. #engchat: for English teachers. Their weekly conversations are Mondays. #mathchat: for Math teachers. Here is a link for Math chat resources. #sschat: for Social Studies teachers. Their weekly conversations are Mondays. #spedchat: for Special Education teachers. Their weekly conversations are Tuesdays. #musedchat: for Music teachers. Their weekly conversations are Mondays. As you can see Twitter has something for everyone. If you are new to the Twittersphere follow these directions and you will find the walls of your small world tumbling down as you begin to share with and learn from other educators from around the world. Begin to follow people of interest. Explore some of the lists and follow a few. Just a few: it is easy to get overwhelmed. This wiki twitter4teachers.pbworks.com has lists of educators for you to check out. Keep track of Tweets and ReTweets using one of the many resources available. Create several columns: search for @yourname to keep track of direct mentions to you, keep track of your friends and keep track of any #hashtags that are important to you. What a Great Post! Thanks Valerie!! I will pass this on to my colleagues! Tech integration in the classroom can be as easy and effective as twitter!! Great introduction for teachers unfamiliar with tweeting! Can’t wait to share it with colleagues. Students would find tweeting engaging. I think it would be perfect for a project based learning unit-collaboration with another school from afar to find a solution to some environmental problem for instance. Yes you are absolutely right that the twitter is the best professional and developmental tool ! And so much of peoples connected with site social networking site makes it the best among all .